Goodreads review: 1001 Australian Nights | Yeah nah. 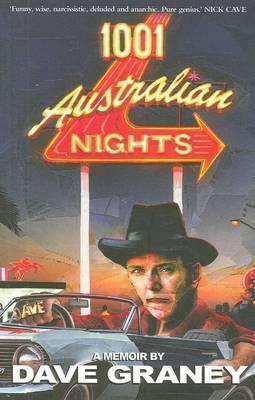 1001 Australian Nights: A Memoir by Dave Graney. Dave Graney is someone who I’ve never understood. But then, I suspect that’s exactly how he likes it. This book is pretty much as you’d expect. It’s a nod and a wink, keeping names on the down-low, except where necessary. You’ll learn a lot about Mt Gambier, about space cake, and about the finer points of noir prose. You’ll hear glowing reports of Cave and co’s road hospitality, you’ll learn about going to the can in a French hospital, and hear a lot more about gigs played in less-than-optimal circumstances. It’s a melange, this. Kind of like a diary that got too big for its boots. There’s a sense of some salaciousness snipped out to keep it nice, but it’s never anything less than honest, albeit with a bemused politeness. The shoulders rubbed are notable, and some of the bitching is vicious, and I must admit that I can no longer look at a vanilla slice the same way, so thanks for that, Dave. 1001 Australian Nights is less organised than the other music bios I’ve read this year – Perko and Rogers play a much straighter game – but this one evokes the heat of the tropics and the tang of six-day velour in a uniquely appealing way. It’s a jobbing muso’s scratchpad, a collection of treasures found in junk shops and an epistle on Australia at play from the entertainer’s viewpoint. Is the tongue in the cheek? Oh, certainly. But it ain’t forked: there’s truth here, just a little better dressed than you’d expect.